Billed as a comedy, “Tower Heist” has hardly any laughs in it, close to none, and waste the talents of Ben Stiller, Eddie Murphy (awkwardly reverting back to his 1980s persona) and even “Precious” star Gabourey Sidibe. It attempts to make a statement about the working class versus the wealthy, but ends up diluting it in a heist plot that could only happen in the parallel universe of moviedom. Josh Kovacs (Ben Stiller) is a concerned manager of a posh luxury condo building, one of the most expensive in New York City. 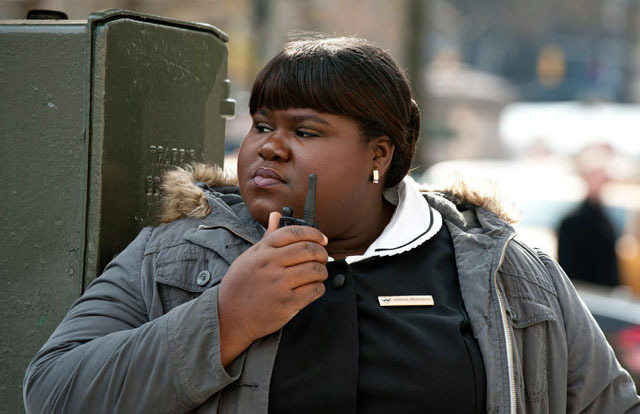 He directs a staff of loyal employees, including concierge Charlie (Casey Affleck), doorman Lester (Stephen Henderson), elevator attendant Enrique (Michael Peña) and service maid Odessa (Gabourey Sidibe). One of the richest residents of the complex is Arthur Shaw (Alan Alda), an investment schemer who often talks down to the staff. The current society is showcased through this condo enclave, as Shaw is convicted of securities fraud, while a neighbor named Mr. Fitzhugh (Matthew Broderick) is being foreclosed upon. When it is learned that Shaw had blown the employee pension fund and Lester’s savings as part of his crimes, manager Kovacs takes matters in his own hands by smashing a prized antique car in Shaw’s apartment. This leads to his firing, and as revenge he plots to steal cash reserves he knows are in the rich man’s apartment, recruiting Enrique, Charlie, Fitzhugh and a petty criminal named Slide (Eddie Murphy) as his cohorts. Motivations are a problem in this film, as in misplaced and not likely. There is a certain shorthand when dealing with star personalities, such as Ben Stiller (angry) and Eddie Murphy (crooked but lovable, as in “48 Hours”) that create gaps in logic, so while the four writers were constructing the story, they conveniently blew over any character nuance in this film by having Stiller smash or Eddie riff, based on better and more accessible roles they’ve had in the past. The supporting cast is even weaker, given less of a stance than even the main characters. Affleck’s Charlie blows with the wind, doorman Lester can be both suicidal and wily, plus Gabourey Sidibe plays a horny maid with a Jamaican accent – not badly, just inappropriately. She’s a presumably low paid immigrant in the service industry, but knows how to crack a high security safe. Right. And what has happened to Matthew Broderick? He looks and acts so tired. There is an effort to address the class disparity that is ripped from today’s headlines, and Alan Alda gives another oily and villainous portrayal as the dismissive rich a-hole. But it only goes as far as revenge, with no long term commentary. That revenge also conveniently produces a dossier that indicts Shaw, in the stupidest hiding place imaginable. Téa Leoni, as Special FBI Agent Claire, represents law enforcement as quite incompetent, which begs the question, who is securing the homeland? And what is with the accents in this movie? Sibide goes Jamaican for no reason than to sound Jamaican, and Stiller tries to affect a neighborhood New Yawk accent that peters in or out depending on the scene. “Hollywood Hills” Ben needs to walk the streets again of his old hometown again, before attempting such a noticeable travesty. Only Matthew Broderick’s depressed monotone seemed real, because what’s happened to Ferris Bueller? Is it the twins? Sarah? Anybody? Oh yeah, there is a heist too. Director Brett Radner has handled this type of material better, and joins the parade of talent either under utilized or desperately recycled. This film exposes a lack of energy, creativity and even the slightest glimmer that anyone involved was working hard on it. This is a perfect example of a ‘sales and marketing’ film. The idea is to buy in before the product hits the streets, to get the opening weekend numbers. We won’t get fooled again. Submitted by ziggy one of th... on November 7, 2011 - 11:28am. I enjoyed this movie is had a lot fo good actors and the ending was great. Submitted by Manny be down on November 11, 2011 - 3:36pm. I feel that this movie was a heist of people money to pay for this film.